Schools Chancellor Carmen Fariña, First Deputy Mayor Tony Shorris and UFT president Michael Mulgrew announced dozens of schools will enter the UFT-supported innovation progaram on July 7, 2014. WASHINGTON HEIGHTS — More than five dozen schools across the city are set to buck the standard Education Department rules and craft their own alternative programs beginning this fall, in a teachers union-approved charter-style innovation program. The Progressive Redesign Opportunity Schools for Excellence program, which is slated to begin next school year, will let 62 handpicked schools break with the city-mandated curriculum and other rules in order to meet the needs of their students — with the approval of the teachers in each school, the teachers union, and the Education Department. For example, some of the schools plan to alter their school calendar and schedule to better accommodate students, while others plan to change teacher evaluations to a portfolio-based system, officials said. Many of the schools in the program have already spoken out in favor of changing some current DOE rules — by eliminating high-stakes testing, for example — including the Beacon School on the Upper West Side, the City as School High School in the West Village and the Urban Academy on the Upper East Side, among others. “What we saw on these applications was that a school was going in for major changes across the board. It really was, 'how do you reconstruct a school around your specific population? '” Schools Chancellor Carmen Fariña said Monday at a press conference at the Community Health Academy of the Heights Junior High School in Washington Heights, which is one of the approved schools. The academy, which covers grades 6 to 12, currently operates under an extended day, but will further tinker with its schedule and add more social services, Fariña said. In addition, the school will be given permission to buy locally sourced produce for its school lunches, a project that would be impossible under current school food contracts. “Community Health Academy of the Heights is excited to be a part of the PROSE initiative as it creates space for us to think outside of the box, try something new, something innovative," principal Mark House said in a statement. "We are excited to see the result of our new initiatives." At the Brooklyn International High School in Vinegar Hill, which serves recently arrived immigrants learning English for the first time, principal Monique Campbell is planning to transition the school's teacher evaluation system to a portfolio-based one that mirrors the system the school already use for students. That portfolio will likely rely on categories including peer visits, observations and professional development, officials said. DOE officials said 107 schools initially applied to take part in the program. Of those, 72 were approved by joint DOE and UFT review panels to proceed to a vote, with 62 schools ultimately accepting the plan. Under the terms of the teachers contract, at least 65 percent of UFT staff in each school had to approve of the changes for them to go forward. 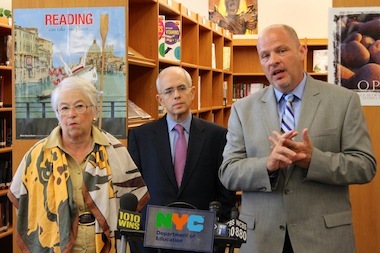 Fariña said the goal is to get at least 200 schools into the PROSE program by the 2019-2020 school year — a number she said she has no fear of reaching given this summer's response. "We said we were hoping to get to 200 schools in five years. Right now, if [we] get 200 schools next year, I’d be thrilled, and we’ll keep adding on,” Fariña said. School officials said the PROSE programs are capped at five years and will be reviewed throughout the process to check on whether they are successful.